LAHORE: (Thursday, August 9, 2018): Punjab University Senate’s 351st meeting was held here at Senate Hall, Old Campus on Thursday after the lapse of almost 12 years as the last meeting of Senate was held in 2007. 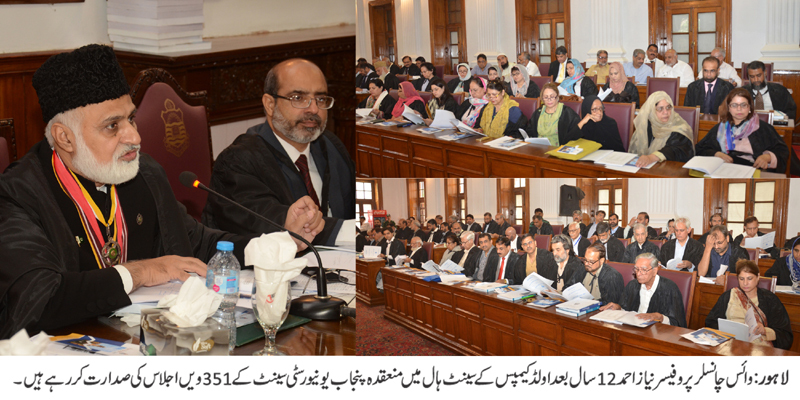 Punjab University Vice Chancellor Prof Niaz Ahmad Akhtar presided over the meeting after permission by the Chancellor/Punjab Governor while around 100 senators participated in the meeting. The Senate approved PU’s 9 billion budget for the year 2018-2019 and also gave ex-post facto approval to the budgets for the previous fiscal years from 2007. The Senate gave approval to adoption of Tenure Track Statues version 2.0, revision in criteria and honorarium for Professor Emeritus, adjustment of sabbatical leaves of the faculty members working on TTS and raising minimum qualification for appointment of lecturer and assistant professors as per HEC notification. Briefing the media after Senate’s meeting, PU Vice Chancellor Prof Niaz Ahmad said that the incumbent administration believed in merit, good governance, transparency and accountability which would be reflected in every operation and function of the university. Therefore, he said, the administration would make all statutory bodies functional and within two months meetings of all statutory bodies had been held. He said that it would be helpful to streamline university affairs and ensure transparency. He said that PU would take part in the race of international ranking of the universities and documents had been submitted for QS Asia ranking. He said that the administration would promote socio-economic impact research so that our country and society could develop. He said that the administration would make efforts for maintaining student-teacher ratio. He said that the university had advertised top positions for removal of ad hoc culture and all positions would be filled on merit. He said that the administration would encourage foreign students and foreign faculty members for internationalizing the university. He said that the administration would restore past glory and academic excellence of the country’s oldest alma matter. He said that the administration would launch a compressed semester program in summer in collaboration with the universities of all provinces to promote provincial harmony. He said that the university had planned to launch fund raising campaign from alumni of the university. To a question, he said that the administration would implement Punjab government and Balochistan government’s policies regarding quota for Balochistani students and the administration would extend full support to the students from Balochistan. He thanked the senators for their contribution in the meeting for the betterment of the university.